"I am just a raindrop, I am smaller than small. What am I doing here? I have no use at all..." So begins the story of The Raindrop. In this adventurous journey, many Truths are uncovered which help the Raindrop remember the higher purpose of his life. This simple and heartfelt story, allows children and adults of all ages to remember the Truth of who they are. I loved the message of this story. We all have a mission. We're all important in our Heavenly Father's plan. It's a truly beautiful book - both the illustrations and the words. I read the book then decided to take it to the important audience - my three sons. They all crowded onto my lap or the edge of the chair and listened intently throughout the story. When I finished I asked, "So what did you think?" "Read it again!" my three-year old demanded. "I liked it," my seven-year old said (he's my man of few words). I turned to my oldest (eleven) before beginning the re-reading for the little one. He cocked his head to the side and said, "I think it's got a great message. It's kind of . . . serious, but it's something every kid should read and think about." So there you have it. It's a serious book about an important issue and each of my children enjoyed it. In fact, I've read it to the three-year old over and over again. He loves how the raindrop learns to laugh. I would definitely recommend it for your children and for you. Thanks for the lovely review of Brian's book. I'm glad you and the kids enjoyed it. 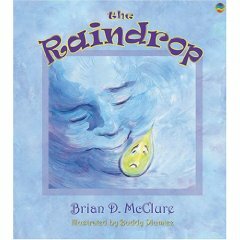 Readers can follow Brian's tour all month long at http://virtualbooktours.wordpress.com/ to read more about The Raindrop and find chances to win a copy of this book. No TV for a week?